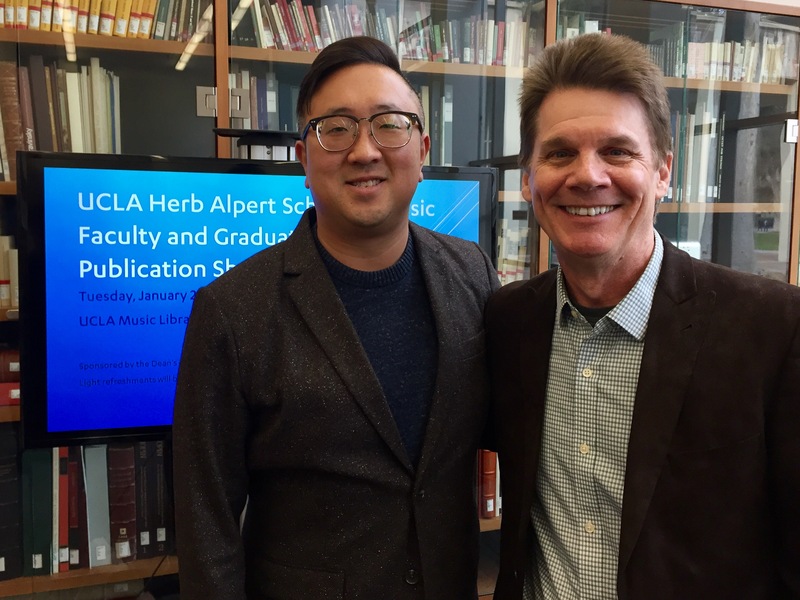 Dr. JB Dyas, the Institute’s Vice President of Education and Curriculum Development, was recognized today as part of the UCLA Herb Alpert School of Music’s inaugural Faculty and Graduate Student Publications Showcase. Sponsored by the Office of the Dean and the UCLA Music Library, the event celebrated a selection of books, individual chapters, and published articles by members of the UCLA music community over the past year. Dr. Dyas, a leader in jazz education, was honored for his recent articles for prospective and current jazz educators. “Living the dream – how to get a job in jazz education” and “Jazzing up jazz band” both appeared in issues of DownBeat magazine. They provided practical advice for music professionals, with tips for organizing student rehearsals, recommended classroom resources, and the “Theoretic Trilogy” for effective tune learning. Also in attendance at the event were Herb Alpert School of Music Founding Dean Judith Smith and Music Department Chair Travis Cross. Librarian Matthew Vest of the UCLA Music Library delivered introductory remarks. When he is not contributing his insights to leading jazz education publications, Dr. Dyas leads the Institute’s National Performing Arts High Schools and Peer-to-Peer jazz education programs, which reach thousands of students across the United States every year. Recent Peer-to-Peer tours have brought renowned jazz masters like Don Braden, Bobby Broom and Dayna Stephens into public schools in Savannah, Georgia; St. Augustine, Florida; Fargo, North Dakota; and San Diego, California. Dr. Dyas also headed up the Institute’s groundbreaking National Jazz Curriculum initiative, which provides comprehensive online teaching resources free of charge to history and social studies instructors in primary and secondary school classrooms. Learn more about the Institute’s public school-based jazz education programs.